Trust homify 360° for your daily dose of architectural exquisiteness. Today’s highlight comes to us all the way from Nuevo León in northern Mexico. This is a unique location, not only for its diverse collection of flora and fauna that can’t be found anywhere else in Mexico, but also for the modern, unforgettable creation that we are viewing here. 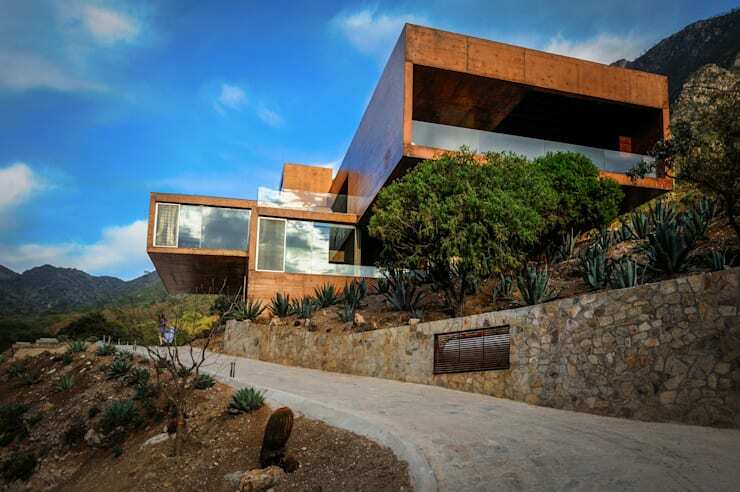 Architectural Mexican team P+0 Architects chose the majestic Sierra Madre Oriental Mountains and dense forest areas as the backdrop for their breathtaking structure. They will also show us how perfect the harmony between architecture and its surrounding landscape can be. A stunning landscape to go with a stunning house. Sounds fair enough. The main idea behind this dream house’s creation? To leave the environment completely untouched and have the structure seemingly integrate with the rough landscape (and simultaneously create a modern space for the contemporary-conscious homeowners to live out their lives in style, of course). To ensure that no trees were removed, as little floor space as possible was used – hence the colossal volumes seemingly suspended in mid-air. Truly a mighty and unforgettable facade, if ever there was one. What is the point of having all that stunning nature as surrounding landscape if you can’t enjoy it? To emphasise the views, a significant number of large-scale glass glazings and windows were inserted. Of course this also increases the natural lighting element, ensuring a clear, open interior. 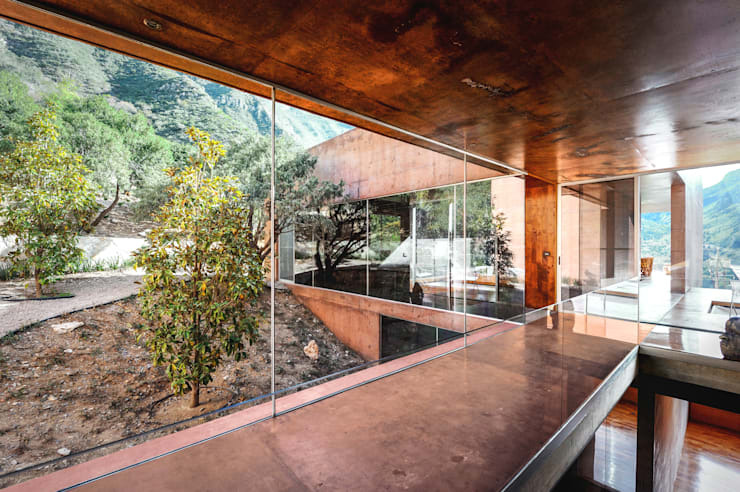 The designers placed great emphasis on sustainability and the harmony with nature – red-coloured concrete and warm wood are the two prime elements of the house. This not only ensures a striking finishing, but also echoes traditional Mexican architecture. The bedroom is located on the second floor. 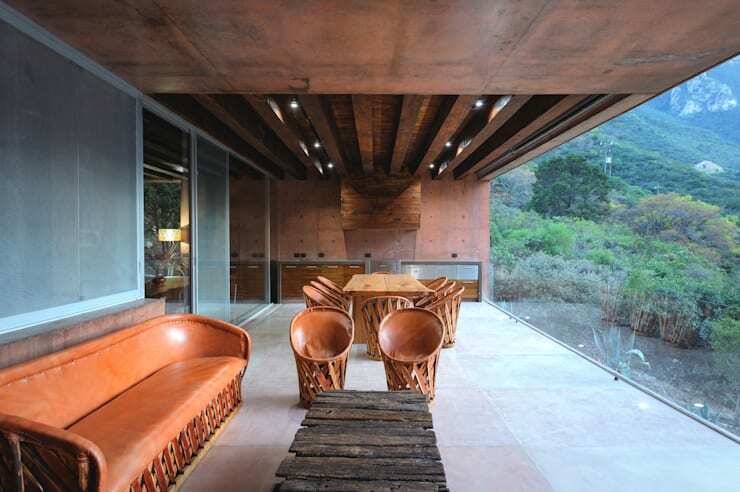 Nature is brought straight into the room, thanks to the views and the abundance of wood used. 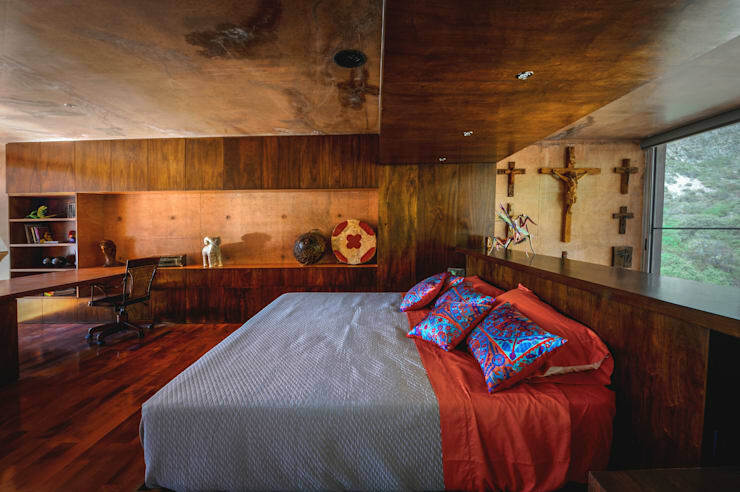 The combination of natural materials and warm colours lends an artistic, almost rustic style to the interior. A soft whisper of blue can be seen in the linen, while the rest of the room leans towards the warmer tones. Personal touches are located here and there in the form of decorative items. It is a strong combination of modern and local art pieces, blended with colonial and post-colonial elements that give the room its atmospheric effect. The living room and dining area share an open-floor plan, and both bring an intriguing mix of modern and regional elements to the space. This results in an eclectic-like style. Those familiar with Mexican art will immediately recognise the paintings, sculptures, and decorative masks. Notice the many colourful accents brought in by the decor and accessories, as well as unique varieties of patterns. 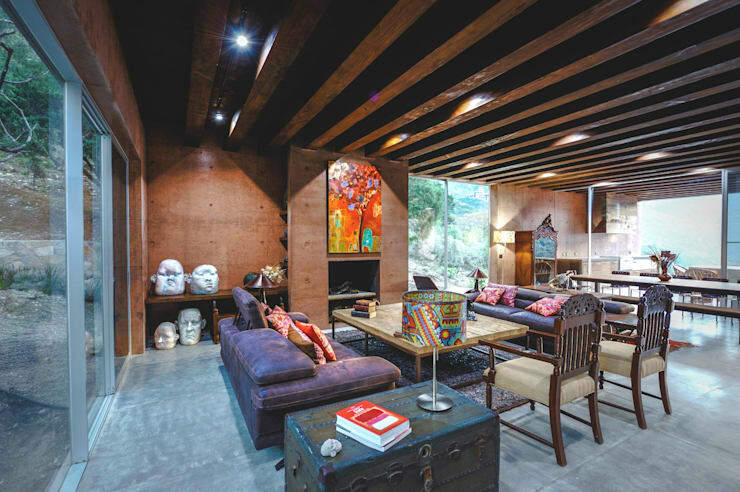 A spacious room that is brought to life by its colours and designs; ideal for a big and loud Mexican family to adorn its space with laughter and chattering. 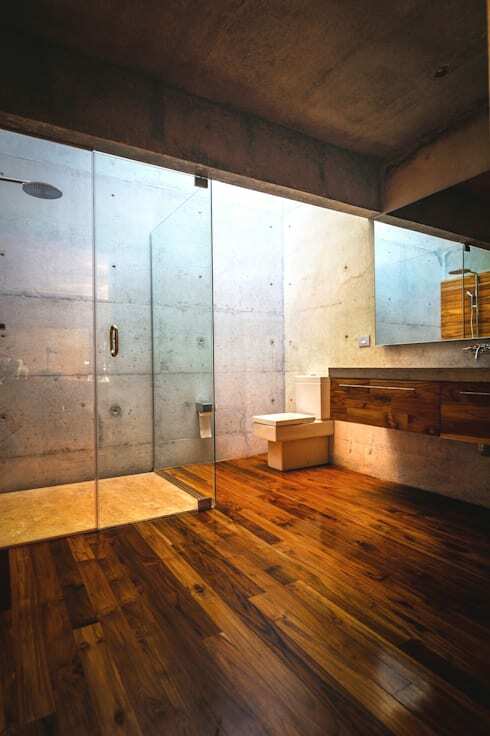 The strong, natural look of the wood continues into the bathroom, adding a local charm to shower time. Notice how it superbly contrasts against the grey concrete wall. This is the perfect blank canvas, ready for a multitude of different decor to embellish its cleanliness. The modern style again surfaces in the form of the pristine glass panels, framing the shower area. 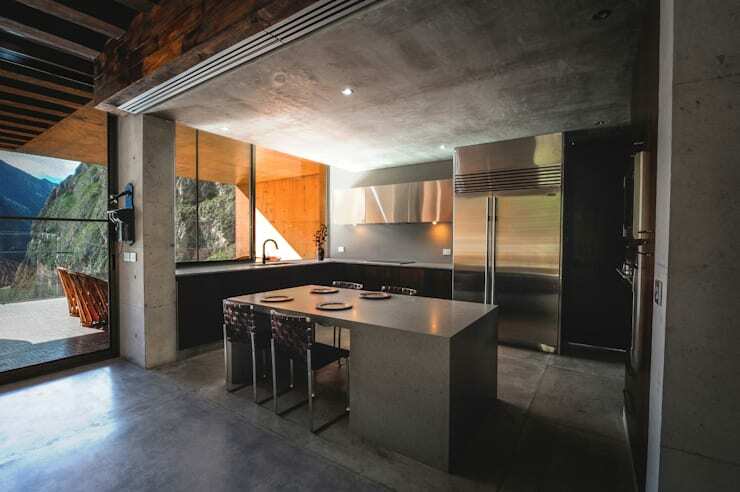 The kitchen, where we find a tasteful and original mix of wood and concrete. The granite and stainless steel add an industrial-like vibe to the area, which has all the necessary appliances to ensure a proper family feast. Notice that there’s no hood with extractor fan – the interior is so big and the sliding windows so wide that there’s no need for one. The terrace outside serves as a perfect second option for mealtime, or to enjoy your first coffee for the day while the surrounding mountains greet you good morning. The house has several terraces at different levels, which provides different views of the surrounding landscape. Here we find a red polished concrete on the outer walls, blending in beautifully with the cognac-toned leather furniture. Modern glass balustrades offer an unhindered view of the environment, to ensure that our al fresco dining receives only the best that the view has to offer. Speaking of dining, let’s gather some tips on: How To Dine In Style: Your Perfect Dining Room. And we've saved the best for last. The fantastic deck terrace to give us the best view possible while sunbathing or cooling off. We have a warm wooden floor for comfort, a couple of stylish designer chairs for lounging, and an intimate splash pool to ward off the heat. The breathtaking landscape takes care of the rest! 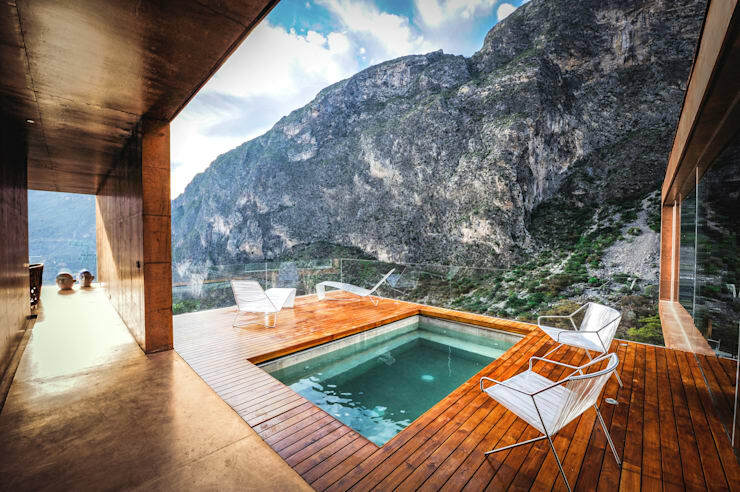 From intimate splash pools to humongous swimming pools intended for some serious exercise (or pool parties), take a look at the options you can find here on homify. What a view to rival that fantastic house! Let us know your thoughts on the home!